This article gives a high-level overview of the process of migrating existing content to your new Help Center knowledge base and community. Migrating content from an external system into Help Center is a multi-step process where data from one step is required for subsequent steps. First, import the authors of all your articles as Zendesk users. Article authors in Help Center must be Zendesk users with the role of "agent". An agent in Zendesk is not necessarily somebody who solves tickets. See Understanding Zendesk Support user roles. To create Zendesk users with the API, see Create User in the Zendesk API docs. Make sure to set the role attribute to "agent" in each POST request. Record the id of each user. You'll need the ids to set the author_id attribute of each article you create in Help Center. Tip: You might want to create a map of each author id and their legacy articles. If you plan on using organizations in user segments to segregate sections, the organizations have be to created before you create users. You can then assign the organization id to the user when creating the user. See Create Organization in the developer docs. If users will belong to multiple organizations, use organization memberships to add organizations to the user record. See Create Category in the Help Center API docs. 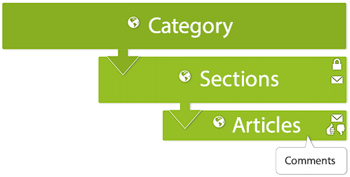 Categories are collections of sections. Record the id of each category. When you create the sections later, you'll need the ids to assign sections to specific categories. If you want to restrict access to certain sections in Help Center, you can assign user segments to the sections. See Create User Segment in the Help Center API docs. Record the id of each user segment. When creating the sections later, you'll need the segment ids to assign access restrictions to sections. See Create Section in the Help Center API docs. Sections are collections of articles. Record the id of each section. When creating the articles later, you'll need the section ids to assign articles to specific sections. When you have all the section ids and user ids from the previous steps, you can create the articles. See Create Article in the Help Center API docs. In addition to title and body, make sure to set author_id and section_id in each POST request. Note that all authors are automatically subscribed to their articles. If Help Center has been activated, they'll get an email notification when the article is created. If an article has inline images that aren't hosted on a public file server such as Amazon S3, upload the images to Help Center. See Create Unassociated Attachment in the developer docs. Make sure to set inline parameter to true. Use the content_url to update the image url in the article HTML. See also Associate Attachments in Bulk to Article. To import comments, you'll need an author id and the article's id. Both agents and end users can be authors of comments. See Create Comment in the developer docs. Note that a comment author is automatically subscribed to the article. If Help Center has been activated, they'll get an email notification when the comment is created. If you want to restrict access to certain topics, you'll need user segment ids. See Create User Segment in the developer docs. When creating the topics later, you'll need the user segment ids to assign access restrictions to topics. See Create Topic in the developer docs. If applicable, make sure to set user_segment_id in the POST request. Record the id of each topic. When creating the topics later, you'll need the topic ids to assign posts to specific topics. See Create Post in the developer docs. In addition to title and details, make sure to set author_id and topic_id in each POST request. Unlike KB articles, authors of community posts can be agents or end users. When creating a post, the author is automatically subscribed to all updates in that topic and will be notified when a new post is created or updated. All subscribers of the same topic receive an email notification when the post is created. To prevent subscribers from being overwhelmed by notifications when bulk importing posts, include a notify_subscribers parameter with a value of false in your POST requests. After creating the posts and getting their ids, you can now add their associated comments. See Create Comment in the developer docs. Comments can only be created one at time. When creating a post comment, the author of the comment is automatically subscribed to all updates in that topic and will be notified when a new post is created or updated. All subscribers of the same topic receive an email notification when the comment is created. To prevent subscribers from being overwhelmed by notifications, include a notify_subscribers parameter with a value of false in your POST requests. Hi Nick, thanks very much for pointing this link out! I've now fixed the problem, and the link is working now. You mention above that authors need to be agents. Can they be Light Agents or do they need to be Full Agents? I am asking because I will be migrating content from an existing knowledge management platform into Zendesk and some of the articles are written by people who no longer work at the company...what do you recommend in such a scenario? When you're passing an article into Zendesk through the API, the system doesn't care so much who the original author is, so long as an authorized user is referenced as the author. So regardless of who wrote the article in your former platform, so long as you give Zendesk a value for the author when you create the article, and said author has an agent equivalent role within Zendesk with the appropriate Guide permissions, your article creation will go over just fine. That comes from our document on Understanding Guide Roles and Setting Permissions. Any guidance on migrating existing content from Discourse? My company's current user articles are located within that platform and it seems quite intensive to be able to migrate to Zendesk. Any tips? Or posts you can point me to? I reached out internally and it doesn't look like we have much information to provide with regards to migrating data over from Discourse to Zendesk. Your developers will want to use the Discourse API to export that data from Discourse and use the Zendesk API to import that data into Guide. How can I migrate my old tickets and knowledge base to Support?